Snickers eggs are the perfect Easter candy for the snickers lover. Who can resist milk chocolate, peanuts and creamy caramel ? Snickers eggs are the perfect Easter basket candy or to even hide for your Easter eggs hunt. 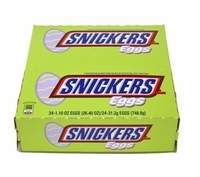 Each box has 24 1 oz Snickers Eggs.